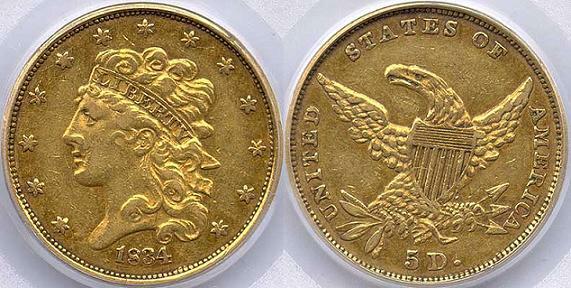 The Half Eagle is a 5 dollar gold coin produced by the United States Mint from 1795 to 1929. They were authorized by the Act of April 2, 1792. 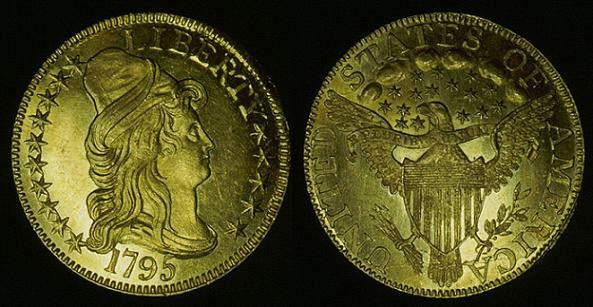 The half eagle was the first gold coin actually struck for the United States. 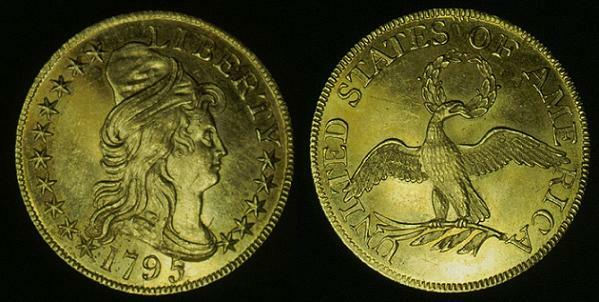 There are several varieties of Half Eagle 5 dollar gold coins due to changes in the number of stars on the coin as well as changes to the style of the eagle on the reverse. Overdates and differences in the size of the numbers in the dates account for still more varieties. Information about the major designs of the Half Eagle is available below. 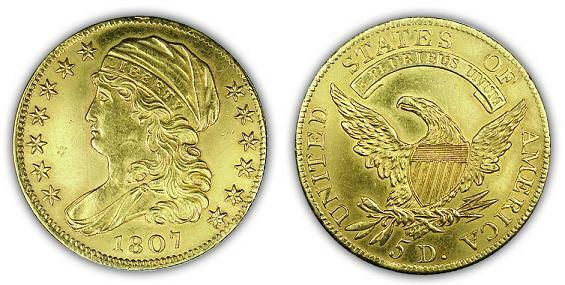 Turban Head Half Eagles are 5 dollar gold coins produced by the United States Mint from 1795 to 1807. Like their Quarter Eagle Counterpart, they feature Liberty wearing a turban-like cap. 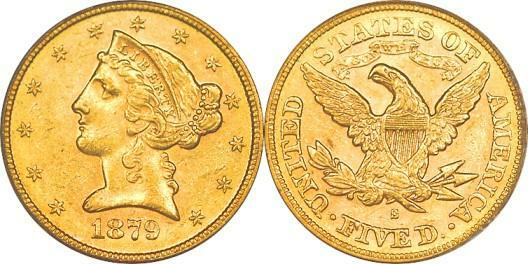 They also share with the Quarter Eagle the fact that many were melted down for their gold content. These 5 dollar gold coins are expensive due to their rarity, however it is possible to put together a date set if you have a budget that will allow it. A collection including all major die varities, however, would be near impossible due to the extremely rare (only 7 are known to exist) 1798 plain eagle reverse. Information about designer, weight, composition, diameter, and mints is listed in a table further down. Click here to go there now. Although the Capped Bust Half Eagle is a relatively short series of 5 dollar gold coins, this series does contains some of the most rare and valuable U.S. gold coin types. However, nice examples of the more common dates are available at fairly reasonable prices, considering that they are gold coins. The Classic Head Half Eagle 5 dollar gold coin shares the same design as the Classic Head Quarter Eagle depicting Liberty with a ribbon in her curly hair. These 5 dollar gold coins were minted in higher numbers, however, making them more affordable to collectors than their $2.50 counterpart. It is possible for interested collectors to put together a complete set of the Classic Head Half Eagle series. The 1938 coins from the Charlotte and Dahlonega mints are the most scarce of this series, but they are still affordable, considering that they are gold coins. The Liberty Head Half Eagle, sometimes referred to as the $5 Coronet Head, were produced by the U.S. Mint from 1839 to 1908. They are one of the longest running coin series and the only denomination that was produced at all seven United States branch mints. These 5 dollar gold coins saw little change in their 69 years of production. In 1840 Liberty's head was slightly modified and the diameter of the coin was decreased to 21.6 mm. Then in 1866 the motto IN GOD WE TRUST was added to the reverse. The Liberty Head Half Eagle was widely used by the American public at a time when $5 was often the amount of a weeks wages. These coins are extremely rare in the better conditions. 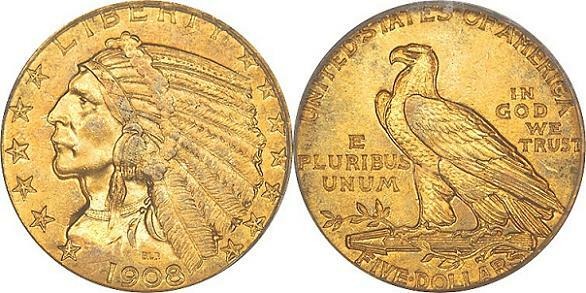 The Indian Head Half Eagle, like the Indian Head Quarter Eagle, has an incuse design. These are the only two U.S. Coins with an incuse design. The term incuse, for a coin design, means that instead of the design of the coin being raised above the surface as with other coins, it is actually stamped into the metal of the coin. Indian Head 5 dollar gold coins are all reasonably priced for gold coins, with the exception of the 1929 which is scarce. You could probably find one without a whole lot of trouble, but expect to pay several thousand dollars for it. Don't forget to visit Amazon to get your very own Kindle e-reader and a variety of Books about Coins . That way you can take all of your coin books with you where ever you go. I love my Kindle Fire ! I highly recommend them to everyone! I know that any time I see a coin at a flea market or coin shop or anywhere else I happen to be, all I have to do is check it out in one of the many books on my Kindle Fire. That way I can refresh my memory at any time and know for certain when I am getting a good deal on any coin. This is an example of what to expect when you hover over words written in red throughout this site. hover over it with your cursor to see the definition of that word.